We started the new week with a new location, as we said adeus to Rio and olá to Bahia on Monday. 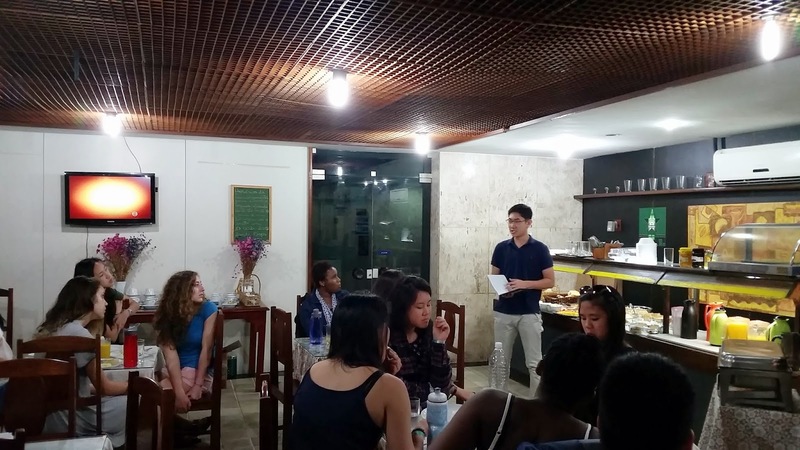 Before heading out though, Rintaro Shinohara '17 gave us an overview of Bahia's capital city of Salvador. You too can read up about Rintaro's extensive research on Salvador right here! Jessica Yang '17 then discussed land reform, an important issue throughout Brazil's history that continues to be felt today. Jessica shared with us the many failed attempts and broken promises of meaningful reform. Check out her pamphlet here! After flying in to Salvador, we took a short bus ride along the coast to Praia do Forte. With the long travel day, we took the evening a little easier. Thanks to Isabelle, we enjoyed an fantastic Brazilian treat of açaí to cool off and gain a little energy for the rest of the night. After an introduction to Bahai from Javier, we took time to reflect on the day and trip so far. Jennifer asked the students to consider one image that they would like to capture in writing. looked out the window for all 110 minutes of the flight to Salvador today. As we left the ground I saw the high rises and favelas of Rio. We went through the first layer of clouds that looked like small puffs of cotton and I could see the coast expanding. As we went through the second layer of clouds, this time long and flat, we left the city behind and headed into the heart of Brazil. There were no high rises or coasts or sparkling lights. There was no developed grandness, but there were small winding roads through valleys and large rivers with smaller streams adding into them. The streams merged but the colors from the different rivers stayed separate. It was not developed beauty, but it was grand beauty. Next to the small town there was a large red river. I've never seen this before and the image of the town next to the river was just very pretty. The red river would curve around the town as if it was caressing it. This gentleness was symbolic to Brazil's nature. Chellandra Samuels '17 wanted to simply "capture and have forever...the smiles and laughter of everybody today." On Tuesday, we will begin exploring around Praia do Forte, with a trip into the Atlantic Forest to start the day off!